"...on that terrible day when the heavens and the earth are moved." For many months in 2014, Apprentice Tyler and yours truly debated whether the crucifixion depicts Jesus dead or suffering. Apprentice Tyler took the former position and I took the later position. Firstly, from my experience as an altar boy in the Orthodox Church, I knew Jesus is not depicted as being in pain (it would not be acceptable to depict Jesus suffering, after all, He is the King of Glory) and while I knew the Roman Church iconography has evolved since the Renaissance and does show Jesus' suffering, I knew he was alive. Secondly, I was certain that He is alive, since the suffering savior makes the enactment of the Mass more dramatic than if Jesus is dead overhanging the altar. The evidence that convinced me of my error was the final station of the cross where Jesus is placed in the tomb and, historically speaking, there is no station of the resurrection. At the end of the stations of the cross, the pilgrim is confronted with Jesus in the tomb and Jesus on the cross over the altar and can only come to one conclusion: Jesus is dead. 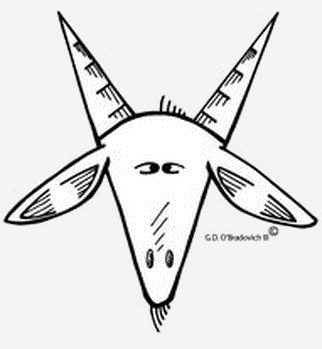 The lesson: Great Occultists are constantly learning. While Apprentice Tyler was babbling about Purgatory (how he divines his subject matter is a mystery to me), my mind wandered in a desperate quest to discover the nature of the universe. I was brought back to reality by the following image from his phone. 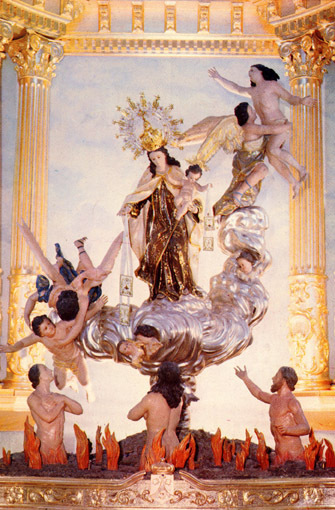 The text described souls and angels in Purgatory and, since I knew angels are not in Purgatory, I explained that the souls are in Purgatory (the flames), Mary is crowned as Queen of heaven (and, therefore, in heaven) and the angel holding the departed at the top right reinforces that Mary, the angel and the saved are in different states: Heaven (bliss) than those in Purgatory (pain). According to the Catholic Catechism, all the souls in Purgatory will eventually reach heaven. While Purgatory is important for the departed, we gather it is less important to the living, as Purgatory only consists of three sections, out of over 2,000 sections, in the Catechism. 1031 The Church gives the name Purgatory to this final purification of the elect, which is entirely different from the punishment of the damned. The Church formulated her doctrine of faith on Purgatory especially at the Councils of Florence and Trent. The Councils of Florence (1436) and Trent (16th century) are recent developments in Catholic doctrine. We must agree with Apprentice Tyler when he states that Vatican Two's statement ("Our doctrine has not changed, we express ourselves differently.") can be applied to every century of the Roman Church's documented existence. 1472 "... every sin ... must be purified either here on earth, or after death in the state called Purgatory." In the Roman tradition, Mary has many titles including Beata Maria Virgo Perdolens, translated as our Lady of sorrows. According to Google translate, "perdolons" means "overwhelmed" and since the translator does not offer any synonyms, we are confident that the translation should be "Our overwhelmed Lady". If Mary is in Purgatory, then it would not be an understatement that she would be overwhelmed with the sins of the "elect" or faithful. Per Wikipedia, Catholics during the Middle Ages speculated that Purgatory was one of four divisions of Hell. Yours truly has attempted to write a Requiem for decades, but the textual imagery is difficult and the Mass, as a whole, is less intriguing or dramatic than operas like "The Magic Flute" or a "Titus Andronicus" or an oratorio "A Day in the Garden". Repeated failed attempts at settings of the mass has led yours truly to research almost the entire text and although the expected words are present, there are several lines of the Requiem text that seem out of place, as listed below. However, Mozart, Verdi and countless other composers have set the entire text without any reservations. Do not destroy me on that day. Do not let Tartarus swallow them. Do not let them fall into darkness. "Ne me perdas" stands out if only because one would expect another word than "destroy" when referring to the Final Judgement. I inserted "Magdelene" for clarification, since the original text is ambiguous. While there is nothing odd concerning "spem dedisti", I have included it because "hope" is a part of the Roman Catholic salvation concept. The text of the Requiem Mass explicitly states and agrees with the modern Catechism that the departed faithful are in hell ("fidelum defunctorum...inferni"). This is correct since Purgatory is a division of Hell. The "deep lake" may be found in the book of Revelations (19:20 and 20:15). Tartarus is found once in the New Testament, 2 Peter 2:4, and this passage explains that God cast the angels into Tartarus to be held until Judgement. Interestingly, Saint Peter links Tartarus with darkness ("into chains of darkness") just as the Mass links Tartarus with darkness ("obscurum"). From the Requiem and the New Testament, we are led to believe that souls and angels are found in Tartarus. While we would expect that the Catholic Catechism is a "how to get to heaven" guide, experience has insulated us from deep disappointment. It seems that the Roman Church can only offer "the hope of the possibility of eternal salvation" and not "the assurance of eternal salvation" as found in Protestantism. Assurance is found seven times in the Catechism. One example is : "Faith is the assurance of things hoped for..."
The hope of the departed is that they immediately find themselves in Heaven. If this hope is not realized, then the purging fires of Purgatory is only remaining hope that is expressly available to the departed. The remaining possibility is Hell and the departed will never experience Heaven. 1056 "...the Church warns the faithful of the "sad and lamentable reality of eternal death" ... called "hell."" 1033 "This state of definitive self-exclusion from communion with God and the blessed is called "hell." We learn that "eternal death" and "definitive self exclusion from communion with God" are other designations for "hell". 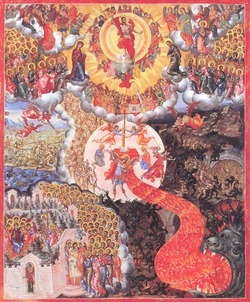 This exclusion from the communion with God is Hell and this concept of Hell is similar to the Orthodox understanding of Hell, where those separated from God can see Heaven and the Saints in bliss. The idea that the damned are in Hell and removed from God, Christ and the Saints, but can see them in Heaven, is a torture that the Medieval Catholic theologians could not understand since their recourse is to describe tortures and sufferings that are seen in the physical world. We do not understand why "eternal death" is a synonym for Hell, since the literal meaning of "eternal death" or "morte aeterna" implies no suffering. We must conclude that "eternal death" is Hell and "eternal life" is Heaven are parallels. The Libera Me and In Parasisum are, technically speaking, not part of the Requiem. The elect in Purgatory are assured of salvation as the Catechism teaches. This leads to one questioning the meaning of "Free me..from eternal death". Eternal death is to be understood as Hell and, since no one in Hell will be delivered to Heaven, we are confronted with three possibilities: a contradiction, an inconsistency or superfluous text. 1. A contradiction exists if those in Hell can achieve Heaven. We presume that this is the meaning of the petition: "Deliver me, Lord, from eternal death". 2. An inconsistency might exist if the elect in Purgatory are asking to be delivered to Heaven. This could be explained by the fact they do not know that Heaven is their final destination. "Tremens factus sum ego et timeo, dum discussio venerit atque ventura irae.."
The elect, who Saint Paul reminds us that they shall judge angels, should not "tremble and fear" judgment. The "wrath" should be directed at the damned, not at the elect in Purgatory. 3. The text is superfluous if the elect in Purgatory are guaranteed salvation. Although this text can be described as superfluous, it is consistent with Catholic doctrine that prayers in this world assist the departed faithful in the next world. It is incredulous that those who were raised in Roman Catholicism, who were competent in Latin and who possessed greater compositional talents than your truly, did not question the Latin text that they were using. I refer specifically to Mozart and Verdi who are considered two of the greatest opera composers. Dramatic opera can not be described as "great" if there are inconsistencies inherent in the dialogue. Great opera can not have contradictions in the plot development that can not be explained with some thought and reflection. For example: although the Brotherhood admits only men, however Pamina was judged worthy to join because of her courage and steadfastness in the trials by fire and water. Either I do not understand Roman Catholic teaching because what it teaches is obscure or it teaches obscurely. The words and implications of the Requiem Mass when studied, unlike opera, do not clarify, but confuse. Eternal existence in Hell or Eternal non existence. The choice of eternity, Gentle Reader, may be given to the sinner. Your guilt has been determined. ​This is merely a sentencing hearing. Now, what will it be?